Following on from the 2008-issued, dropped-out-of-sight, no-we-didn’t-see-it Exceptional Cask Series Mark I, Foursquare issued the 9 year old Port Cask Finish ECS Mark II in 2014 (and in a neat piece of humorous irony, it didn’t mention Mark-anything on the label, and wasn’t really a finished rum). And in 2015 the game changed with the solid triumph of the 2004 Mark III. The wholly-Bourbon-cask-aged Mark I 10 YO “1998” was, in my opinion, a toe in the water, issued at a meek 40% and seemed like a way to test whether a different blending philosophy could be used to move away from the RL Seale’s 10 YO, Rum 66, Doorly’s XO and 12 YO rums without replacing them entirely. The Port Cask Finish released six years later in 2014 wasn’t getting too adventurous with its strength either, but it did show where Foursquare’s thinking was heading: a pot/column blend aged three years in bourbon barrels, six in port barrels. As I recall from the year it came out, it made a modest kind of splash – “an interesting new direction for Foursquare” went one supercilious FB comment – but the madness of today’s sell-out-before-they-go-on-sale had to wait a little longer to gain real traction. By 2015, Foursquare’s strategy clicked into place with the introduction of not one but two new rums, the milquetoast 43% Zinfadel Mark IV for the sweet-toothed and general soft-rum-loving audience, and something more feral for the fanboys – the 2004 11 YO Mark III, a straight-up bourbon-cask-aged rum, also a pot/column blend, unleashed at a muscular 59%. That strength provided the 2004 with a crisp snap on the nose that was quite a step up from anything from the company I had tried before. It was fruity, precise and forcefully clean in a way that clearly demonstrated that a higher proof was not a disqualifier for greater audience appreciation. It smelled of wine, grapes, red grapefruit and mixed that up with scents of sourdough bread, unsweetened yoghurt and bananas. As if that wasn’t enough, after standing for a while, it exuded aromas of coconut shavings, irish coffee,vanilla, cumin and cardamom that invited further nosing just to wring the last oodles of scent from the glass. The day I tried it, this rum was in some really good Bajan company, lemme tell you, and it held its own in fine style – so yes, that’s an unambiguous endorsement. Overall, the 2004 was a solid, well-constructed rum with a panoply of tastes that could hardly be faulted. 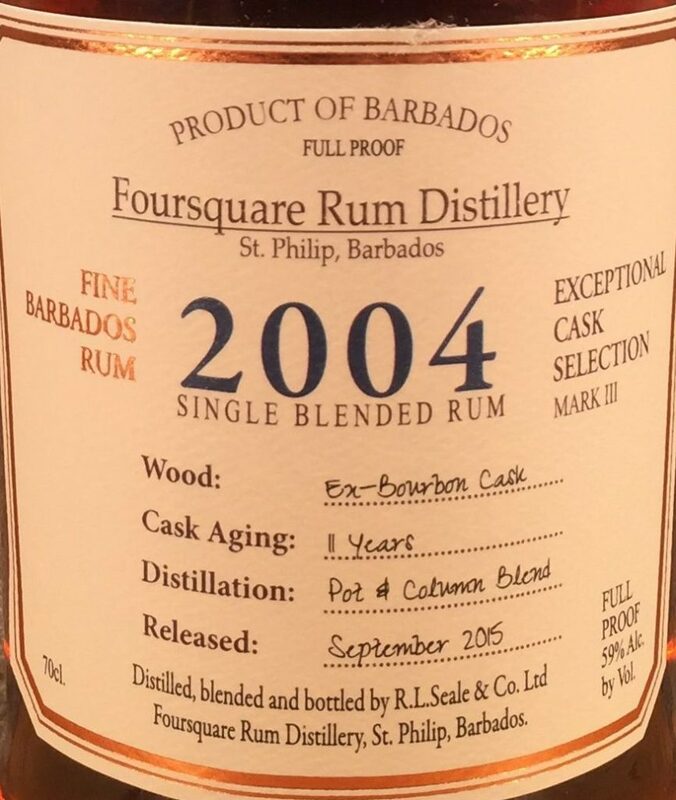 It was way ahead of anything Foursquare had made before, instantly pushed the “standard” 4S/Seale/Doorly lines into second-tier status, and to my mind did more than any other single rum to mark Foursquare’s future ascendance and reputation on the Bajan rum scene. It pointed the way to the superlative 2006 10 Year Old, the excellence of the Criterion Mark V, and all the other Exceptional Casks to come, like the 2005, the Dominus and the Premise. Best of all, continuing a philosophy Foursquare have adhered to ever since for the Exceptionals, it wasn’t priced out of sight — and those who saw it for what it was and managed to buy a bottle or a case, had very little to complain about, because the rum was and remains on the short list of Foursquare’s real good ‘uns. Their best rums, whether made alone or with the Habitation, mix controlled passion and cheerful excess, uninterested in any kind of subtle statements, and you know what? — with this one, Richard may even have cracked a smile as he made it. Copyright is inherent when an original work is created. This means that the producer of original work is automatically granted copyright protection. Whether explicitly stated on the relevant post or page or not, all of the work produced on this blog is protected by copyright, including pictures, graphics and all of the articles. These original works may not be copied, quoted or reused in any way whatsoever without the permission of the author Lance Surujbally. Copyright ©Lance Surujbally (The Lone Caner) 2010-2019. All Rights Reserved. Text, graphics, and HTML code are protected by US and International Copyright Laws, and may not be copied, reprinted, published, translated, hosted, or otherwise distributed by any means without explicit permission.